Starting with our popular RackMac mini 1U rackmount enclosure as a template, we created a specially-designed 1U rack enclosure to securely house your Mac mini(1), and provide it strategic airflow cooling. Then, inspired by the demand for our Echo™ Express line of Thunderbolt 2-to-PCIe card expansion systems, we added two PCIe 2.0 expansion slots (with integrated power supply and fans) that connect to the Mac mini via its Thunderbolt port, included a central power hub for the Mac mini and PCIe slots’ power supply, and finished by adding an additional Thunderbolt 2 port for daisy chaining to other Thunderbolt devices. For added convenience, the front panel provides a USB 3.0 port and a power button while other Mac mini interface ports are extended to the back of the chassis and mounted on the rear panel for convenient interfacing of Gigabit Ethernet, HDMI and two USB 3.0 connections. The PCIe expansion slots power on and off in unison with the Mac mini. To support a wide range of popular mobile racks, carts and portable rack cases, the fourth generation xMac mini Server is just 17.75" deep. Mac mini, PCIe cards, and cables shown in photos that are not included with xMac mini Servers are shown for illustration purposes; items sold separately. Mac mini and PCIe cards sold separately. Thunderbolt 2 upgrade exchange kit for xMac mini Server is available for purchase at nominal fee. Upgrade is compatible only with third and fourth generation xMac mini Server (part no. XMAC-MS-A); older models not supported. This upgrade is NOT part of the Thunderbolt 2 upgrade program for Echo Express III-D, III-R, or SE II. Thunderbolt cable lock compatible with Apple and Sonnet copper Thunderbolt cables. Not compatible with optical Thunderbolt cables. 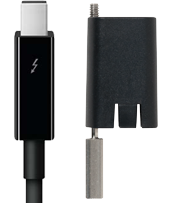 Thunderbolt cable lock is compatible with Apple and Sonnet Thunderbolt cables. For more information see Support Article FAQ 785.
xMac mini Servers with serial numbers starting with A, B, C or D with a number less than 0103100000000000 shipped from with 10Gbps Thunderbolt and may NOT be upgraded to Thunderbolt 2.
xMac mini Servers with serial numbers starting with A or C with a number greater than or equal to 0103100000000000 shipped from with 10Gbps Thunderbolt and may be upgraded to Thunderbolt 2.
xMac mini Servers with serial numbers starting with B or D with a number greater than or equal to 0103100000000000 shipped from with 20Gbps Thunderbolt 2.
xMac mini Server can transform a Mac mini with OS X Server into a full-function metadata controller for an Xsan setup, or into a metaSAN metadata master. This combo also makes an ideal replacement for an aging Apple Xserve. Racking up a second xMac mini setup as described above provides two redundant metadata controllers that occupy a total of just 2U of rack space and cost a fraction of available alternatives. xMac mini Server can transform a Mac mini with OS X Server into more robust server with high-capacity RAID storage connected. Take full advantage of the SATA storage and Ethernet bandwidth using OS X Server's powerful services such as managed-access file sharing, built-in calendar, mail, podcasting, VPN, and Web server capabilities, or use FileMaker® Pro server to host your FileMaker Pro databases. SATA storage can be served at 250MB/sec to users. xMac mini Server can enable you to deploy virtually unlimited RAID-protected shared storage across a larger network. Sonnet's Presto 10GbE 1-Port 10 Gigabit Ethernet adapter card plugged into the half-length PCIe card slot, connected to a Gigabit Ethernet switch. This setup will serve the large storage pool (storage capacity can be increased by daisy chaining up to seven Fusion RX1600 Expansion systems) to a workgroup with an aggregate speed of up to 750 MB/sec of local storage speed and aggregate network access speeds of up to 425 MB/sec. xMac mini Server can transform a Mac mini with OS X Server into a video ingest station for Avid® and Final Cut® suites. A high-performance video capture card (like a RED ROCKET, BlackMagic DeckLink, or AJA Kona) plugged into the full-length PCIe card slot. A SAS controller card (such as the ATTO ExpressSAS H680) installed in half-length PCIe card slot, connecting one SAS port to nearline rackmount SAS RAID storage and the second SAS port to rack-mounted LTO tape backup. Mac mini Server enables you to create an extremely compact and powerful ProTools multitrack recording rig that occupies just 1U of space. An AVID Pro Tools|HD Native PCIe card plugged into the half-length PCIe card slot, connected to one or more AVID Pro Tools HD Series interfaces or mixing board. A Sonnet Tempo SSD PCIe drive card with one or two SSDs attached, installed in the full-length PCIe card slot. This setup will enable you to work with up to 256 voiceable audio tracks recorded to and played back from one or two high-speed SSDs at up to 600 MB/s read, 380 MB/s write.